The VISPO (Visual Poetry) collaborative book project has helped me to reconnect with Richard Diebenkorn's work and I've learned much that I've filtered and tried to respond to in my pages. For Christmas I received Richard Diebenkorn's Ocean Park Series. For those of you who don't know, Diebenkorn lived in California. He spent time at Stanford University, where I studied painting and drawing. His contemporaries were some of my professors. They were from the 'California School': Frank Lobdell, Keith Boyle and Nathan Olivera. Olivera and Lobdell taught me to use monotype. They also made monotypes with Diebenkorn. As I read the essays in the Ocean Park book I began to see my Stanford experience from a new angle. familiar things I'd heard from Lobdell, Olivera and Boyle came back and fell into a new context. At Stanford there was a strong tradition of life drawing, a place that Diebenkorn came from. Interestingly, Diebenkorn stopped working figuratively once he embarked on the Ocean Park series. I am at a crossroads as have just moved into a big, beautiful studio with much light. It was a similar impetus that triggered Diebenkorn's shift. I am curious to see the impact of a place on work, imagery and meaning. 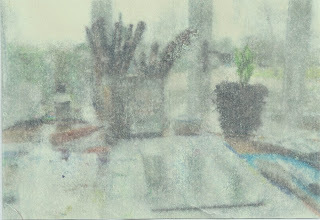 The back page (shown here) is an inkjet transfer of the view from my studio drawing table after I had completed the monotype for the front One of the interesting things I learned about Diebenkorn was that he was one of the first artists to see the world by air. A govt scheme took him up in a plane to see the California landscape from a plane. those layers of experience do leave their mark... Not surprisingly,Diebenkorn's work was called 'visual poetry' by one critic. One of the essays in the book is by Peter Levitt, poet etc... 'Richard Diebenkorn and the poetics of place'. Wow what a piece of writing! So much fun to be involved in a collaborative project. So wonderful to have so much to learn and so much to explore ahead!